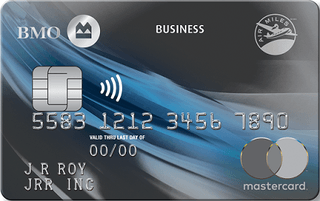 BMO AIR MILES Business Mastercard is typically available to those with excellent credit scores (650 or greater). On purchases made at Shell locations in Canada (including, Beaver, Turbo and Payless) to a maximum of $2,500 in any monthly billing period. The rewards scheme offered by the BMO Air Miles No-Fee Business Mastercard is a little slim, so if you’d like a more robust rewards offering, consider the second option: The BMO Air Miles Business Mastercard. This credit card has an annual fee of $120, and that annual fee allows you to earn more substantial Air Miles rewards. For every $10 you spend on this credit card, you’ll earn 1 reward mile. At participating Shell stations you’ll earn 1.25 rewards miles on purchases, up to a maximum of $2,500 in purchases in every monthly billing period.